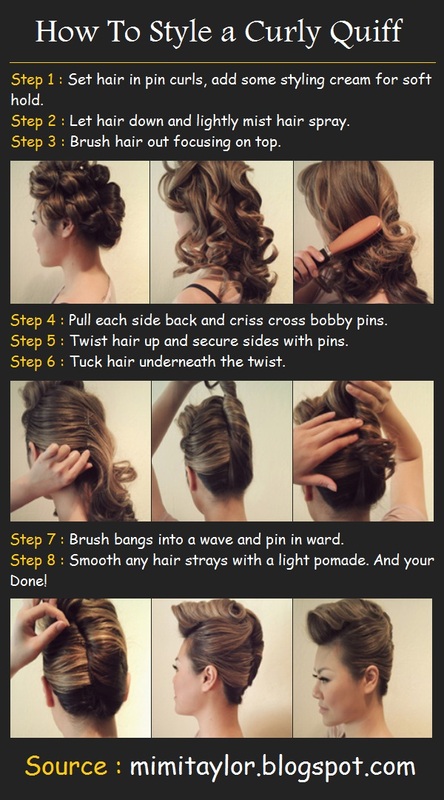 1 : Set hair in pin curls, add some styling cream for soft hold. 2 : Let hair down and lightly mist hair spray. 3 : Brush hair out focusing on top. 4 : Pull each side back and criss cross bobby pins. 6 : Tuck hair underneath the twist. 7 : Brush bangs into a wave and pin in ward. 8 : Smooth any hair strays with a light pomade. And your Done!